If you thought Black Friday deals were just for big screen TVs and trendy consumer electronics you probably don’t need, think again: there’s a pretty sweet sale going on for Dungeons & Dragons 5th Edition in both digital and dead-tree formats. 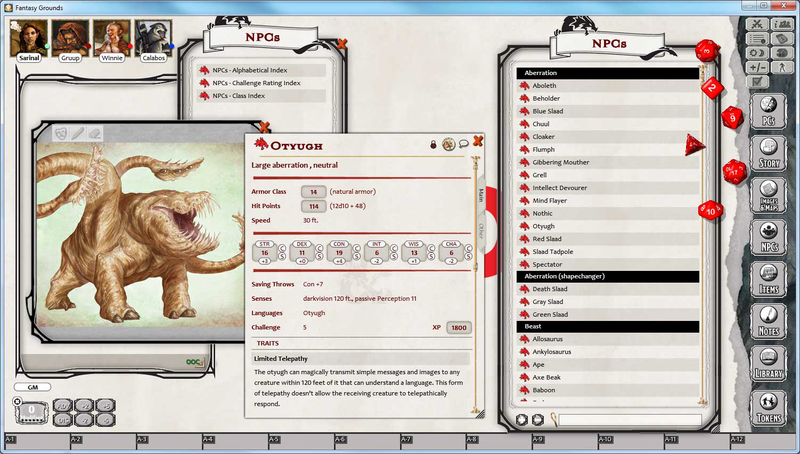 Back in July, I reviewed virtual tabletop solution Fantasy Grounds, which is the first and only VTT to offer officially licensed Dungeons & Dragons 5th Edition content. I noted at the time that the steep cost would be a barrier for many players, but that the adventure modules were worth every penny. We’ve seen small discounts before, but never like this (note: Mundangerous receives no compensation from Fantasy Grounds.) To put it bluntly, I love Fantasy Grounds’ D&D 5E content at the current price point. Each of the required Fantasy Grounds licenses you’ll need to get started are 25% off, bringing the lifetime Ultimate License to a rather more manageable $111.75. The 5E Player’s Handbook and Monster Manual modules (Complete Core Class Pack and Complete Core Monster Pack, respectively) are marked down 40% to $29.99 during the sale. For dungeon masters, the big adventure modules such as Out of the Abyss and The Rise of Tiamat are $19.94 and the medium-sized adventures, such as Hoard of the Dragon Queen, are down to $14.99. Also, the brand new Sword Coast Adventurer’s Guide module, which includes content for both DMs and players, is close to 30% off, at a very reasonable $28.39. My main criticism of Fantasy Grounds’ D&D 5E content was its above-average cost to duplicate content you already own in the physical book form; in my opinion, these prices definitely justify the expense, especially for the juicy, time-saving DM content: the Complete Core Monster Pack and adventure modules. If you’ve been on the fence, now is a great time to jump into Fantasy Grounds, either to find a new group online during the holidays, or to keep your existing group on schedule as everyone travels to be with family. And if you already own a Fantasy Grounds license, this is the best deal on D&D 5E content that we’re liable to see, and all of the Savage Worlds, Pathfinder, Call of Cthulhu, and other content is also marked down. D&D 5E Player’s Handbook – $19.26 after discount. Last week, in our review of the brand new D&D 5E Sword Coast Adventurer’s Guide on the Total Party Thrill podcast, we recommended SCAG as a great supplement, but that the $40 MSRP was simply too high. If you’ve been on the fence, now would be a good time to pick up SCAG, as it’s only $17.67 after discount. This entry was posted in Dungeons & Dragons, News and tagged 5E, Black Friday, d&d, dnd, Dungeons and Dragons, Fantasy Grounds, Sale, Shopping, Virtual Tabletop. Bookmark the permalink.